Greenland, the world's largest island, is a autonomous country under the protection of the Kingdom of Denmark. Settlement is confined to the coast since the interior of the country is covered by a thick ice sheet. The population is less than 60,000. Greenlanders call their country Kalaallit Nunaat. The coastline of Greenland is rugged and deeply cut by long fjords. 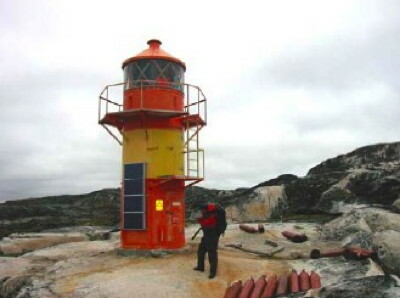 Denmark has installed dozens of navigational lights along this hazardous coast. None are very tall but this page identifies those that are large enough to be considered lighthouses. All the Greenland lights are painted in bright red and yellow colors for good visibility against the usually snowy background. Special thanks to Tom Zane of the Ponce de Leon Inlet Lighthouse museum in Florida. 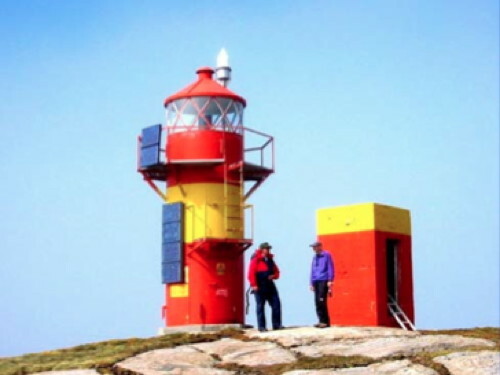 He first asked about Greenland lighthouses and then arranged to secure the information on this page from the Danish Farvandsvæsnet (Maritime Safety Administration), which was then maintaining the lights. Thanks also to Torben Burlund Jensen of the Farvandsvæsnet for assembling the information and photos for us. Danish aids to navigation are now maintained by the the Danish Maritime Authority (Søfartsstyrelsen). ARLHS numbers are from the ARLHS World List of Lights. DKF numbers are from the Dansk Fyrliste. Admiralty numbers are from volume L of the Admiralty List of Lights & Fog Signals. U.S. NGA List numbers are from Publication 110. Photos by various photographers posted by Alexander Trabas. Phots of Greenland lights have been contributed by Rainer Arndt, Douglas Cameron, Erich Hartmann, and Klaus Wolfgang. 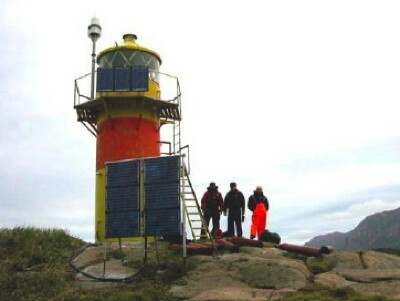 Official Danish light list (in .pdf format); the list includes lights of Greenland and Faroes. 1975. Active; focal plane 90 m (295 ft); flash every 5 s, white, red or green depending on direction. 4.5 m (15 ft) round lantern, painted red. Lightphotos.net has Larry Myhre's photo and Trabas has Rainer Arndt's photo, but clouds block Google's satellite view of the area. Located high above the south side of the entrance to Prince Christian's Sound, on the east coast near the southern tip of Greenland. Site status unknown. ARLHS GRN-017; DKF-7820; Admiralty L5100; NGA 0008. Note: With a population of about 3200, Qaqortoq (formerly Julianehåb) is the principal town in southernmost Greenland and a frequent destination for adventure cruise ships. It has a population of about 3300. 1975. Active; focal plane 20 m (66 ft); three flashes every 8 s, white, red or green depending on direction. 4 m (13 ft) round lantern, painted red. No photo available but Bing has a distant satellite view. Located at the west end of Sardloq Island off the south coast of Greenland, about 16 km (10 mi) southwest of Qaqortoq. Accessible only by boat. Site status unknown. ARLHS GRN-021; DKF-7075; Admiralty L5226; NGA 0092. 1977. Active; focal plane 40 m (131 ft); two flashes every 10 s, white, red or green depending on direction. 5 m (17 ft) round lantern, painted red. Lightphotos.net has Larry Myhre's photo, Trabas has Douglas Cameron's photo, and Google has a satellite view. Located on an island about 13 km (8 mi) northwest of Sardloq. Accessible only by boat. Site status unknown. ARLHS GRN-015; DKF-7080; Admiralty L5228; NGA 0096. 1950. Active; focal plane 27 m (89 ft); flash every 3 s, white, red or green depending on direction. 7 m (23 ft) round cylindrical tower with lantern and gallery, painted red with one yellow horizontal band. A photo is at right, Lightphotos.net has Larry Myhre's photo, and Google has a satellite view. Located on a promontory a short distance west of Qaqortoq. Site status unknown. ARLHS GRN-016; DKF-7085; Admiralty L5230; NGA 0100. Date unknown. Active; focal plane 25 m (82 ft); red light, 1 s on, 1 s off. 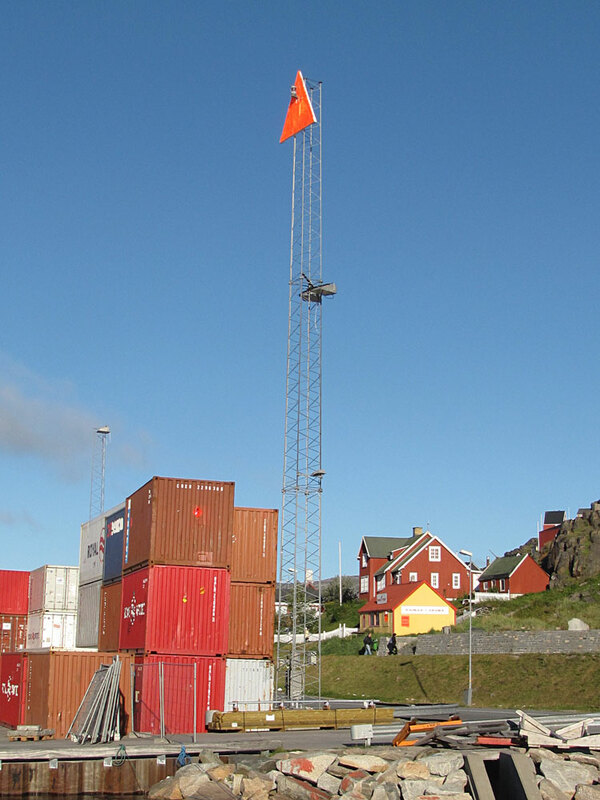 23 m (75 ft) square skeletal mast carrying a triangular orange daymark, point up. Trabas has Douglas Cameron's photo, Lightphotos.net has Robert English's photo of the two range lights, and Google has a street view and a satellite view. Located on the Torvevej on the Qaqortoq waterfront. Site open, tower closed. DKF-7110b; Admiralty L5238; NGA 0116. Date unknown. Active; focal plane 29 m (92 ft); red light, 2 s on, 2 s off. 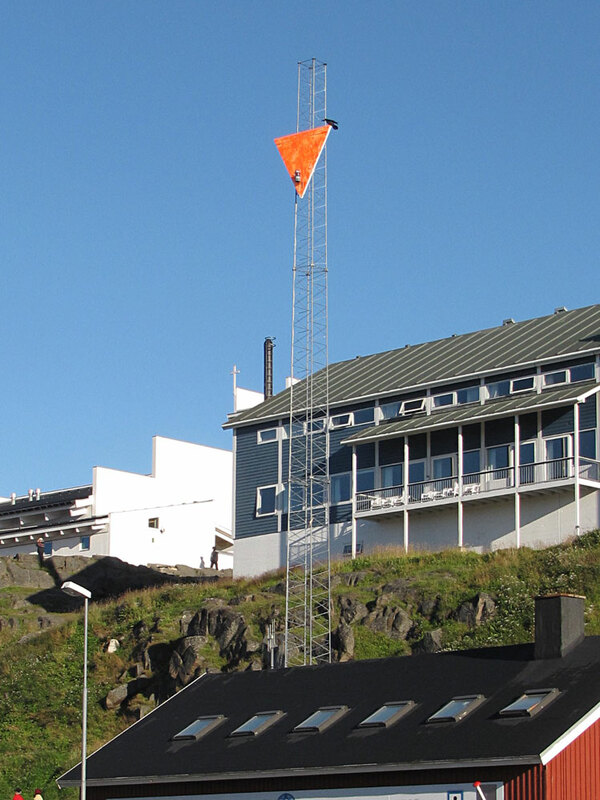 22 m (72 ft) square skeletal mast carrying a triangular orange daymark, point down. Trabas has Douglas Cameron's photo, Lightphotos.net has Robert English's photo of the two range lights, and Google has a street view and a satellite view. 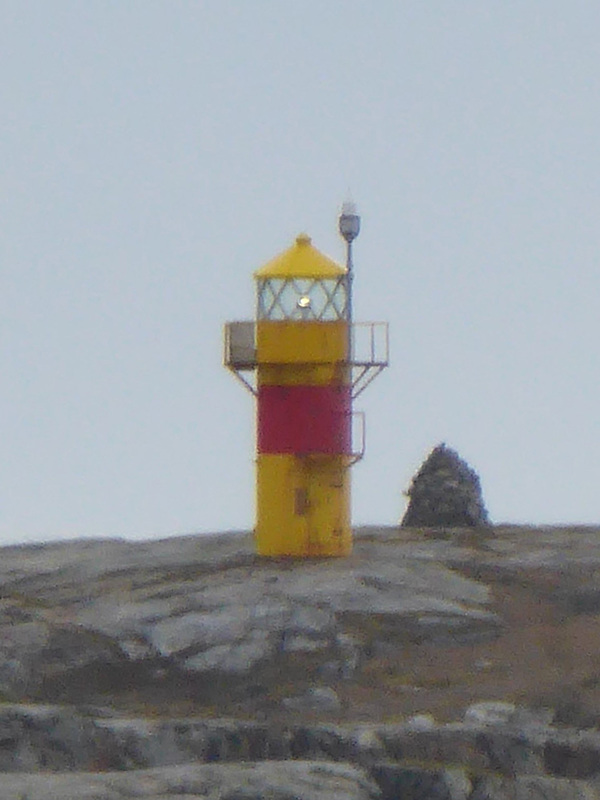 Located above the Torvevej, 39 m (128 ft) north of the front light. Site open, tower closed. DKF-7110a; Admiralty L5238.1; NGA 0120. 1975. Active; focal plane 7 m (23 ft); flash every 5 s, white, red or green depending on direction. 4 m (13 ft) round lantern, painted red. A photo is at right, James Evans has a closeup photo, and the lantern is at the water's edge in a Google satellite view. Located on a rocky promontory near Qaqortoq. Accessible only by boat. Site status unknown. ARLHS GRN-010; DKF-7090; Admiralty L5232; NGA 0104. 1977. Active; focal plane 40 m (131 ft); three flashes every 10 s, white, red or green depending on direction. 4 m (13 ft) round lantern, painted red. No photo available but Google has a satellite view of the light. Located on a small island at the entrance to the Brede Fjord, about 8 km (5 mi) southeast of Qassimiut. Accessible only by boat. Site status unknown. ARLHS GRN-039; DKF-7150; Admiralty L5266; NGA 0156. 1950. Active; focal plane 27 m (89 ft); two flashes every 5 s, white, red or green depending on direction. 7 m (23 ft) round cylindrical tower with lantern and gallery, painted red with one yellow horizontal band. No photo available but Google has a distant satellite view. Located on Qajartalik Island at the entrance to the Arsuk Fjord and the village of Arsuk. Accessible only by boat. Site status unknown. ARLHS GRN-019; DKF-7185; Admiralty L5270; NGA 0160. Note: Paamiut (formerly Frederikshåb) has a population of about 1500 and is the largest settlement on the lower southwest coast of Greenland. 1950. Active; focal plane 20 m (66 ft); three white flashes every 10 s. 7 m (23 ft) round cylindrical tower with lantern and gallery, painted yellow with a red horizontal band. Trabas has Wolfgang's photo and Google has a distant satellite view. Located on a skerry in the entrance to the harbor of Paamiut. Accessible only by boat. Site status unknown. ARLHS GRN-027; DKF-7260; Admiralty L5346; NGA 0228. Date unknown. Active; focal plane 14 m (46 ft); quick-flashing white light. 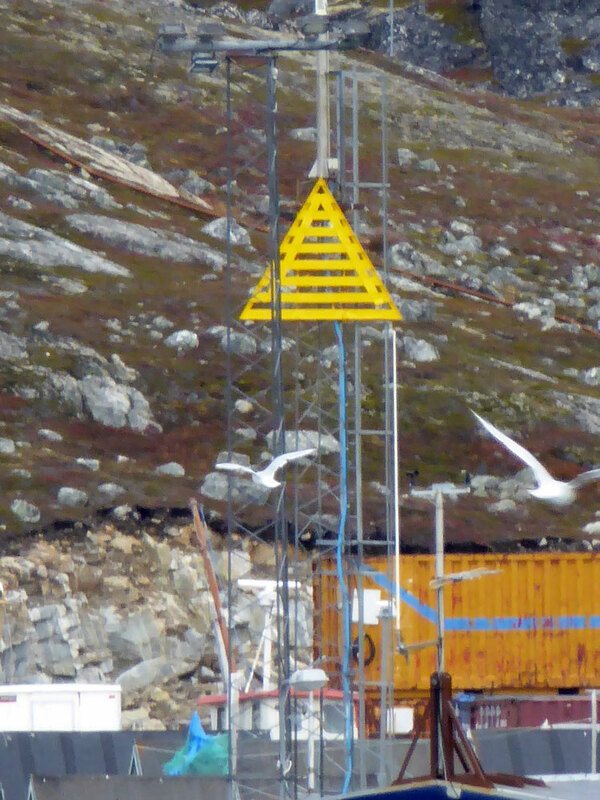 13 m (43 ft) square skeletal mast carrying a triangular orange daymark, point up. Trabas has Wolfgang's photo and Google has a street view and a satellite view. The rear light is on a similar mast only 8 m (26 ft) tall. Located on the Paamiut waterfront, facing southeast down the fjord. Site open, tower closed. DKF-7280b; Admiralty L5348; NGA 0232. Note: Nuuk (formerly Godthåb) is the capital and largest town of Greenland. It has a population of about 17,500 (one fourth of the country's population) and has regular air service from Copenhagen via Air Greenland. 1978. Active; focal plane 19 m (62 ft); flash every 3 s, white, red or green depending on direction. 5 m (17 ft) round lantern, painted red. A photo is at right and Google has an indistinct satellite view. 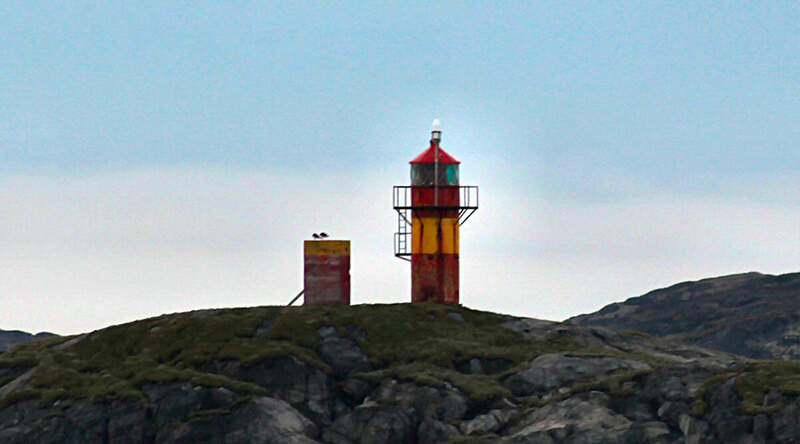 Located on a skerry in the entrance to the harbor of Fiskenæsset, about 125 km (80 mi) southeast of Nuuk. Accessible only by boat. Site status unknown. ARLHS GRN-003; DKF-7305; Admiralty L5400; NGA 0248. 1957. Active; focal plane 21 m (69 ft); flash every 5 s, white, red or green depending on direction. 4 m (13 ft) square cylindrical concrete tower with a small lantern. 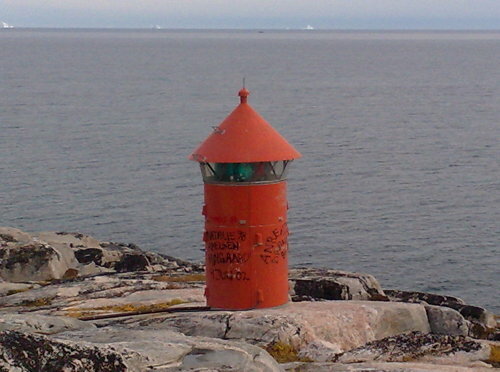 Lighthouse painted white with one red horizontal band; lantern painted red. No photo available but Google has an indistinct satellite view. 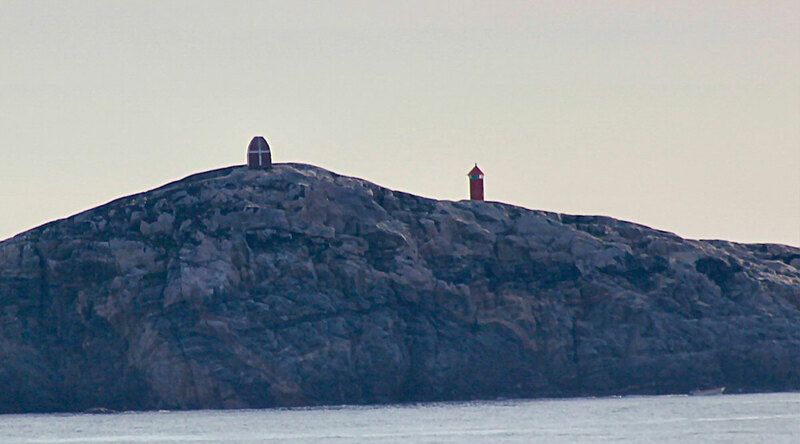 Located on an island at the entrance to Kangerluarsoruseq (Færingehavn), about 50 km (30 mi) south of Nuuk. Site status unknown. ARLHS GRN-022; DKF-7325; Admiralty L5500; NGA 0252. 1964 (station established 1945). Active; focal plane 26 m (85 ft); two flashes every 5 s, white, red or green depending on direction. 7 m (23 ft) round cylindrical tower with lantern and gallery, painted red with one yellow horizontal band. A photo is at the top of this page, Trabas has Rainer Arndt's photo, and Google has a very distant satellite view of the light. 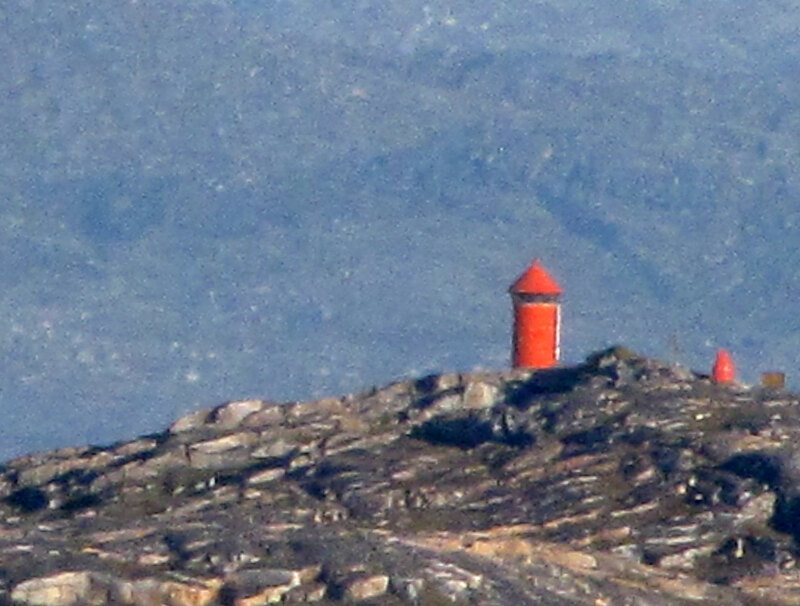 Located on Agtorssuit Island at the entrance to Nuuk (Godthåb). Accessible only by boat. Site status unknown. ARLHS GRN-001; DKF-7385; Admiralty L5550; NGA 0304. 1973. Inactive since 2002. 4 m (13 ft) lantern, painted gray. No photo available. The light is still listed as a daybeacon but it has probably been removed. 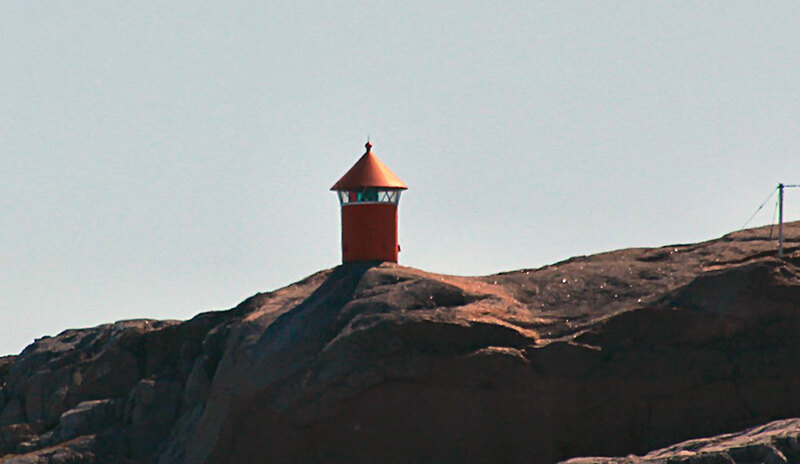 Located at the end of the mole in Nuuk. Site open. ex-Admiralty L5570. Note: Maniitsoq (formerly Sukkertoppen), located about 160 km (100 mi) north of Nuuk, has a population of about 2700. 1950. Active; focal plane 21 m (69 ft); three flashes every 10 s, white, red or green depending on direction. 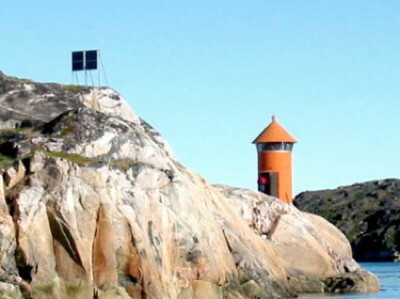 7 m (23 ft) round cylindrical tower with lantern and gallery, painted yellow with one red horizontal band (the reverse of the usual Greenland pattern). No photo available but Google has a distant satellite view. Located on Kitdliaraq Island about 6.5 km (4 mi) south of Maniitsoq. Accessible only by boat. Site status unknown. ARLHS GRN-012; DKF-7435; Admiralty L5580; NGA 0332. 1988 (station established 1950). Active; focal plane 25 m (82 ft); white, red or green light, depending on direction, occulting once every 5 s. 10 m (33 ft) square cylindrical skeletal tower with lantern and gallery. A photo is at right, Renno Hokwerda has a 2010 photo, Trabas has Wolfgang's photo, and Google has a good satellite view. Lantern painted yellow with a red roof. Located on a promontory on the northeast side of Maniitsoq. Readily accessible from the village. Site open, tower closed. ARLHS GRN-030; DKF-7440; Admiralty L5590; NGA 0336. Note: Sisimiut (formerly Holsteinborg) has a population of about 6000 and is Greenland's second largest town. Located about 75 km (45 mi) north of the Arctic Circle, it has the northernmost year-round port in Greenland. 1977. Active; focal plane 42 m (138 ft); flash every 5 s, white, red or green depending on direction. 5 m (17 ft) round lantern, painted red. This is probably the world's hardest-to-spell lighthouse name. No photo available but Bing has a satellite view. Located on an island at the entrance to Itivdleg, about 32 km (20 mi) south of Sisimiut. Site status unknown. ARLHS GRN-020; DKF-7496; Admiralty L5640; NGA 0380. 1950. 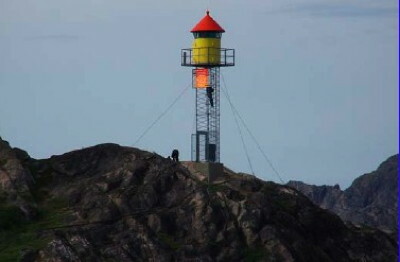 Active; focal plane 37 m (121 ft); white flash every 3 s. 7 m (23 ft) round cylindrical tower with lantern and gallery, painted yellow with one red horizontal band. A photo is at right and Google has a satellite view. Located on an island in the entrance to the harbor of Sisimiut. Accessible only by boat. Site status unknown. ARLHS GRN-013; DKF-7504; Admiralty L5660; NGA 0384. 1977. Active; focal plane 90 m (295 ft); white flash every 5 s. 5 m (17 ft) round lantern, painted red. No photo available and Google has only a very distant satellite view of the area. Located on a promontory on the north side of the entrance to the Isortog Fjord, about 32 km (20 mi) north of Sisimiut. Site status unknown. ARLHS GRN-034; DKF-7560; Admiralty L5718; NGA 0424. Note: Aasiaat (formerly Egedesminde), population about 3100, is a town on an island at the south end of Disko Bay, a large embayment on the west coast of Greenland. Qasigiannguit (formerly Christianshåb) is at the southeastern corner of the bay about 75 km (45 mi) east of Aasiaat; it has a population of about 1200. 1950. 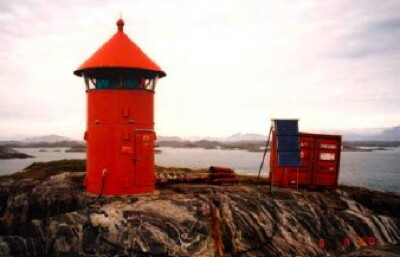 Active; focal plane 45 m (148 ft); two white flashes every 5 s. 7 m (23 ft) round cylindrical tower with lantern and gallery, painted red with one white horizontal band. No photo available and the light is barely visible in Google's satellite view of the island. Vester Ejland, now called Saqqarliup Nunaa, is a 50 km (30 mi) long island south of Aasiaat. Located at the west end of the island, near the abandoned village of Manermiut, about 20 km (13 mi) southwest of Aasiaat. Site status unknown. ARLHS GRN-037; DKF-7580; Admiralty L5800; NGA 0436. 1950. Active; focal plane 18 m (59 ft); flash every 3 s, white, red or green depending on direction. 5 m (17 ft) round cylindrical tower, painted red with one yellow horizontal band. No photo available but Google has an indistinct satellite view. Located on an island about 7 km (4 mi) north of Aasiaat. Site status unknown. ARLHS GRN-036; DKF-7655; Admiralty L5892; NGA 0456. 1995 (station established 1974). Active; focal plane 9 m (30 ft); flash every 3 s, white, red or green depending on direction. 4 m (13 ft) round lantern, painted red. No photo available but Google has a distant satellite view. Located on a skerry at the entrance to the harbor of Qasigiannguit. Site status unknown. ARLHS GRN-014; DKF-7709; Admiralty L5936; NGA 0560. 1978. Active; focal plane 40 m (131 ft); white, red or green light, depending on direction, 8 s on, 2 s off. 5 m (17 ft) round lantern, painted orange. A photo is at right, a 2013 photo is available, Trabas has Rainer Arndt's view from the sea, and Google has a satellite view. 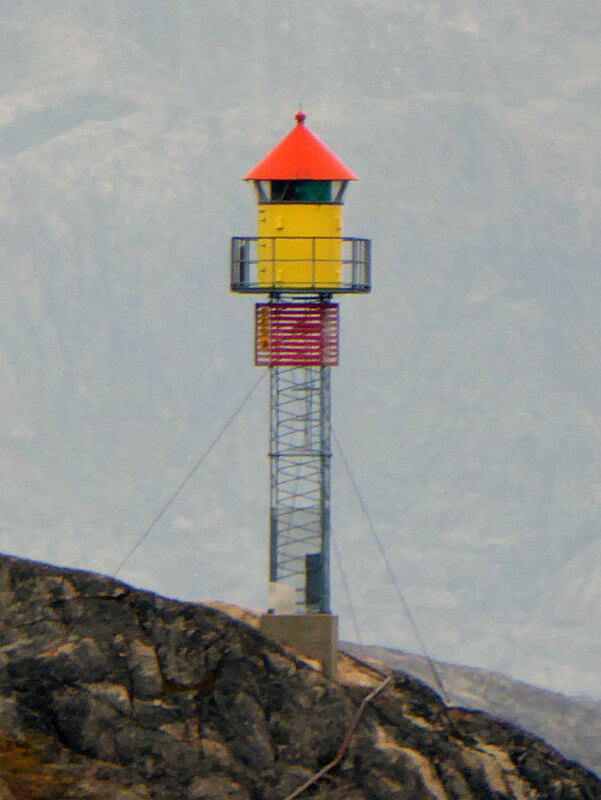 This lighthouse stands on the southernmost point of Qeqertarsuaq (Disko) Island, the largest of the Greenland coast's many islands with a length of about 160 km (100 mi). It guides vessels to the nearby port of Qeqertarsuaq (formerly Godhavn), a village with a population of a little less than 1000. Site status unknown. ARLHS GRN-033; DKF-7675; Admiralty L5918; NGA 0508. Posted November 23, 2008. Checked and revised March 5, 2019. Lighthouses: 23. Site copyright 2019 Russ Rowlett and the University of North Carolina at Chapel Hill.